Order a van and driver, any time, any place. The safe, trustworthy, and affordable on-demand ‘van and driver’ app. Get exact costs for trips you want to book either now or in the future. Signup to become a Vanuse driver! Looking for a reliable logistics partner? Click here! Our customers can be sure that a Vanuse van and driver will always be just around the corner. Drivers can count on transparent partnership, and easy payment. In just one easy tap, you’ll be able to request a van and driver and we have plenty of options to make life as easy and as stress-free as possible. Booking your van and driver is really easy, whether that’s for right now or another day. We’ve integrated Google Maps into our app, meaning that it’s even easier to get from A to B, no matter where you’re off to. 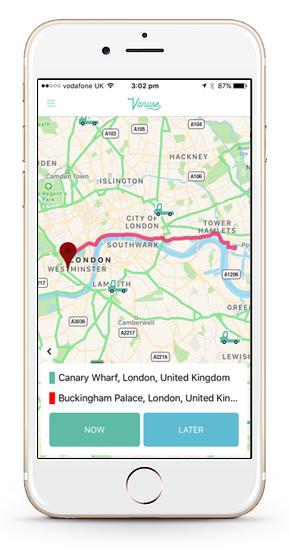 It’s easy; all you need to do is add your items, enter your route and our app will tell you just how much your trip will cost. Pay by credit or debit card stress-free with our guaranteed secure payment system, powered by Stripe. Fancy getting £5 off your next van ride? Refer a friend to us and we’ll give you both £5 when they complete their first trip. All you need to do is head to the promo section in the app to find out more. Got a driver’s license, a van and a smartphone? Then we want you to join our brilliant team of van drivers. Work as much or as little as you want and start reaping the benefits! Get your stuff to where it need’s to go in just a few taps! Whether you’re a business with a need to offer same day delivery, or someone putting on an event, or you’ve just impulse-bought a huge aquarium, you can be sure that Vanuse is always there to lend a helping hand when you need it. FREE quotes, book from your location and more. Order a Van and Driver Now! Vanuse is for everyone, and we welcome business clients – set up a Vanuse for Business account to solve your transport needs, whatever you’re doing. Get all the latest exciting Vanuse news and updates! Our friendly customer support team are always on-hand to answer any questions. Click here to get in touch.